In this segment the appearance of textile is important, in combination with high durability and safety. 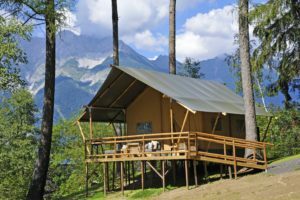 Glamorous camping, otherwise known as glamping, combines high comfort with the outdoors. With a fully equipped tent and terrace the campers can enjoy nature from their ‘doorstep’. A wonderful feeling of freedom! This relatively new range of rental tents is growing spectacularly and is slowly replacing the well-known 'rows of stationary caravans’. Various specialists have now developed a wide range of fully equipped camping solutions. 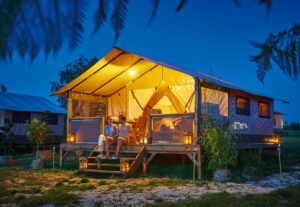 From luxurious safari lodges in African style to fully folding camping containers with luxurious bathrooms and lounge areas with air conditioning; everything is possible. 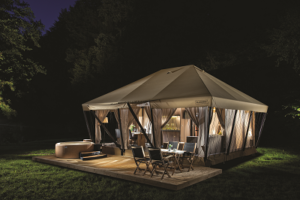 When it comes to glamping, a beautiful appearance of the tent is important, in combination with high durability and safety. In this range, our strong and breathable TenCate PolyCotton quality is widely used and our flame-retardant TenCate Campshield fabric is also becoming increasingly popular.